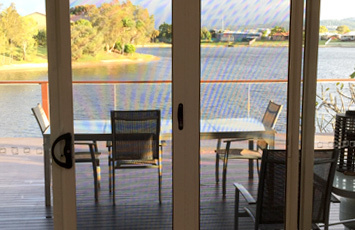 INVISI-GARD Sliding Doors, Windows and Security Screens combine the proven strength and security of 316 Marine Grade Stainless Steel Mesh with extruded aluminium perimeter framing to create a security window screen that looks great whilst providing excellent security. Designed to protect, built to last. Diamond grills provide an extra barrier against unwanted intrusion, trespass and burglars, while allowing unrestricted airflow and vision outdoors. All grills have a 7mm strand thickness and meet the requirements of the Australian Security Door Standard AS 5039. The finished installation is lightweight for ease of use, yet sturdy and secure. 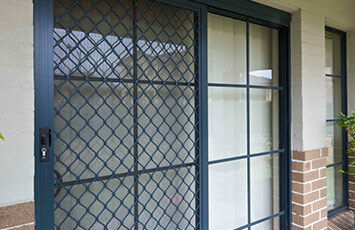 Diamond grills are perfect for sliding security doors. We can build and install any screen with any mesh to keep out those unwanted bugs. See the various mesh types we use below for more information to help you decide which mesh suits you. Is the most commonly used mesh to keep out bugs and insects. It is a resillient, long lasting mesh that will not crease, dent or unravel. Paw Proof Mesh is made from a flexible fibreglass mesh that gives slightly. It lasts longer and is much stronger than standard fibreglass mesh. It will not rust or corrode and is ideal for high traffic areas with pets and children etc. Aluminium mesh is a heavy duty alternative to fibreglass mesh. It is strong durable and withstands all climates and environmental conditions. Midgee Mesh is a finer fibreglass mesh with more strands than standard fibreglass mesh. It is used to protect against tiny insects such as sandflies or midgees that are common in wet-land areas. Ideal if you’re looking for added privacy. One Way Vision Mesh allows you to see out through your window while visibility into your home is reduced. A The INVISI-GARD 316 STAINLESS STEEL SECURITY range of products has been fully TESTED and APPROVED in accordance with all of the relevant Australian Standards. This product range includes Stainless Steel Security Doors, Window Screens and Escape Window Screens. The INVISI-GARD Dealership network is required to produce these products to the exact conditions detailed in the NATA CERTIFIED TEST REPORTS. They must also INSTALL these products in accordance with AS5040. INVISI-GARD 316 STAINLESS STEEL SECURITY has been approved by DETE for use in State Schools and many Public buildings in Queensland and is used extensively, in all States within Australia. Projects such as the ‘Mater Childcare’ [see Specification Kit for further details] used INVISI-GARD 316 STAINLESS STEEL SECURITY because of it’s superior corrosion resistance and performance. Incorporating the unique patented EGP Retention System, INVISI-GARD Fixed Window Security Screens can be custom manufactured to fit many brands and styles of window and can be ordered with or without midrails. 316 Marine Grade Stainless Steel Mesh is used in all INVISI-GARD Stainless Steel Security Products and it is because of this Marine Grade Stainless Steel that INVISI-GARD out performs all other stainless steel security products when it comes to corrosion resistance. Product strength and performance are key factors in deciding which security screens to purchase. 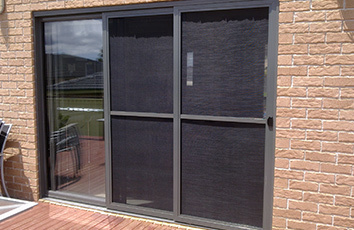 All INVISI-GARD Fixed Window Security Screens have been tested to Australian Standards AS5039-2008 so you can be assured that when choosing INVISI-GARD, you are choosing the finest in Stainless Steel Security Products. We will repair or replace old sliders, screens and locks. We understand that accidents or just general wear and tear can create minor problems and are happy to assist wherever you require – No matter how small.